I toyed with the idea of calling this post “Turn This Stupid Fat Rat Yellow”, but decided one could push an allusion too far. 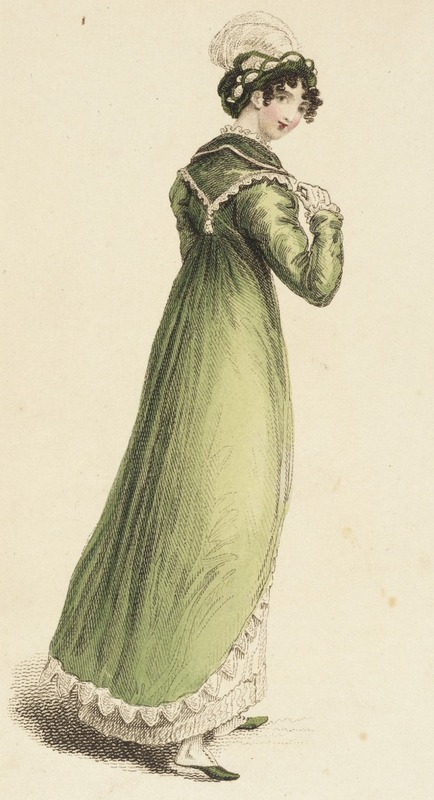 Now that I have two day gowns and a spencer, a pelisse was the obvious addition to my wardrobe. Pelisses were extremely popular in 1816, which was known as the Year Without a Summer. Temperatures (already at the tail end of the centuries long cooling period known as the Little Ice Age) were very low the entire year due to the massive eruption of Mount Tambora in Indonesia, so women would take any extra warmth they could get. 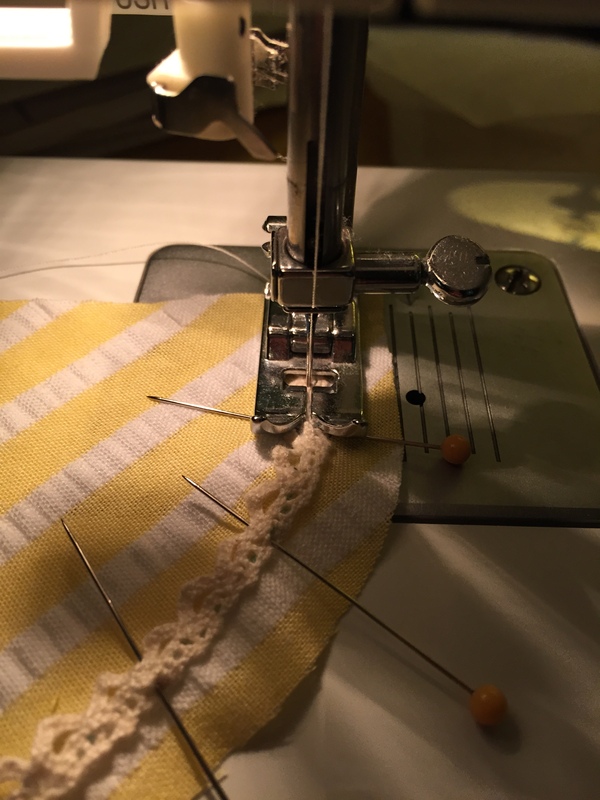 Check out that turban–a possible use for my extra yard of fabric! Since this plate shows only the back, and I could find no description of the front, I had to dig around a bit to determine what the front might have looked like. Capelets like this were relatively common, but often shown from the back, since they were (presumably) the most unique and interesting detail about the piece, but I was able to use plates like the one below for inspiration. Though much of her bodice is covered with that amazing cascading ruff, you can see that the cape folds down and comes down to a point at the underbust. 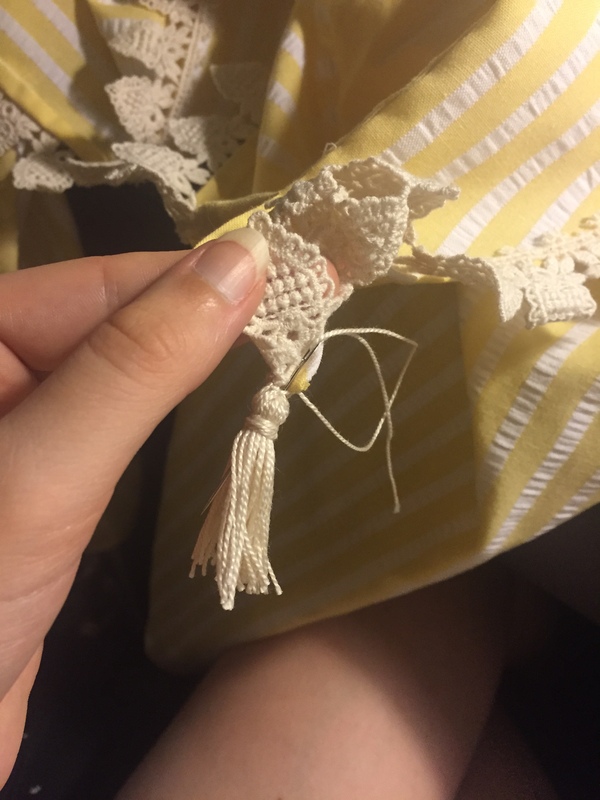 I couldn’t do exactly that, because my inspiration plate also has a collar, and the collar has to attach somewhere, but this at least gave me a jumping off point for the basic line of the design. 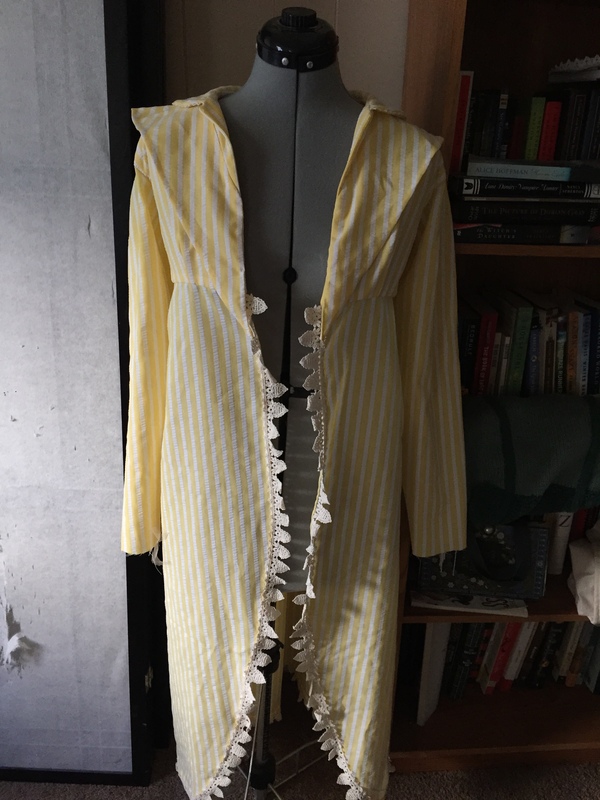 In the end, I attached the collar in the normal way, and made the capelet a separate piece that was blindstitched in place. 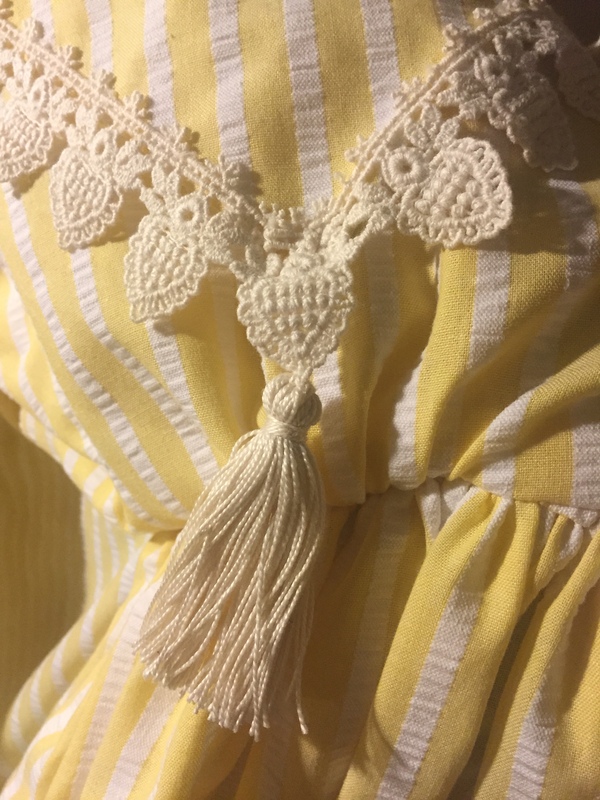 The ends extend slightly below the waist and have little tassels on them to go with the tassels at the back of the cape. I did several rounds of mockups to get the shape and drape of the cape and collar just how I wanted them, but as usual when I’m concentrating on mockups, I didn’t think to get pictures of all the steps. I must work on that. I did, however get a picture of how the skirt works. 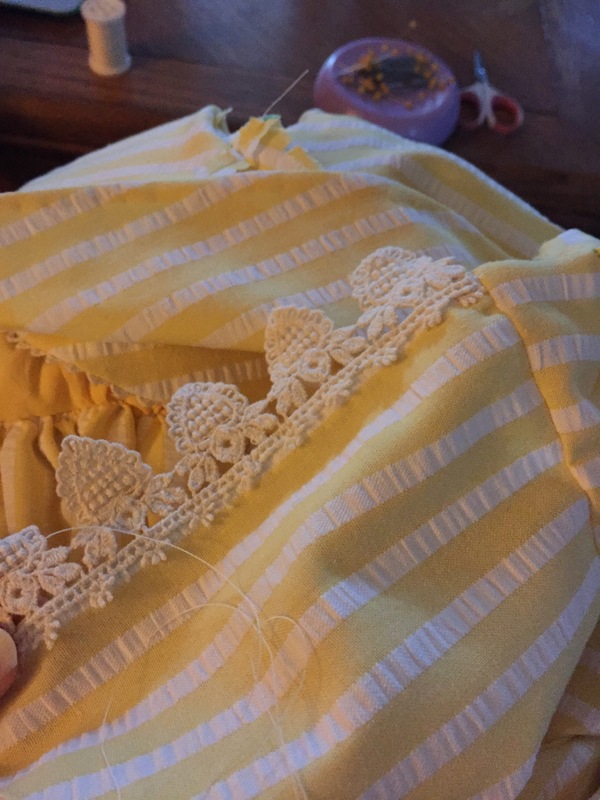 The skirt in my inspiration plate, instead of falling straight down and being squared off at the bottom, curves from the waist around to the back, leaving the front of the gown skirt exposed. 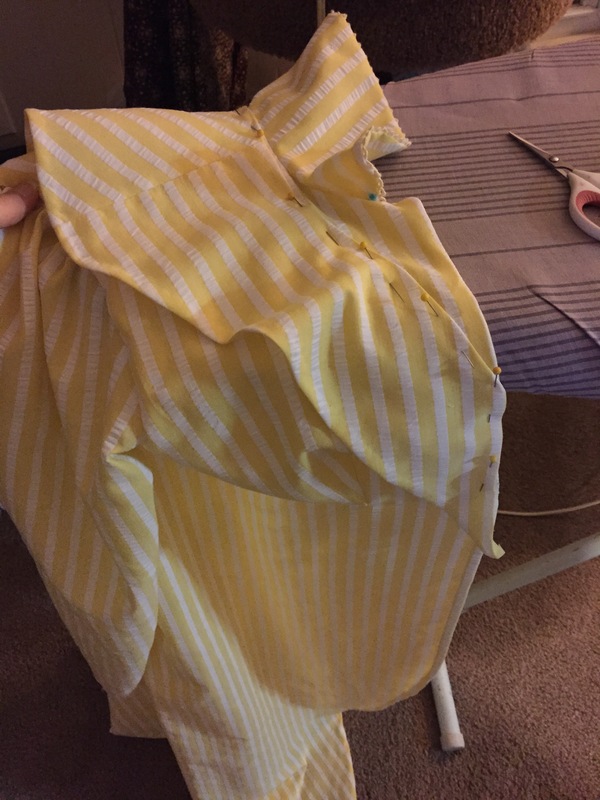 I originally intended to do this with three pieces, one in back and two in front, but as I was drafting, I realized that I had so much fabric that I could do the entire skirt in a single piece, since the front pieces of the skirt would have been extremely small in any case. 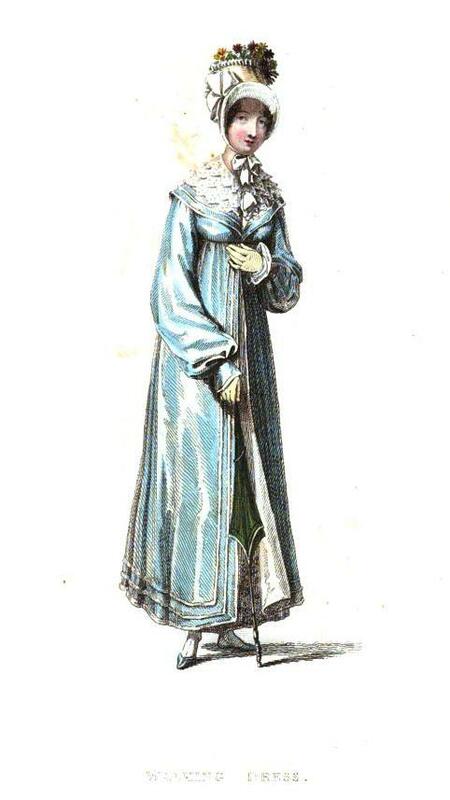 I used the Sensibility Regency Gown Pattern. 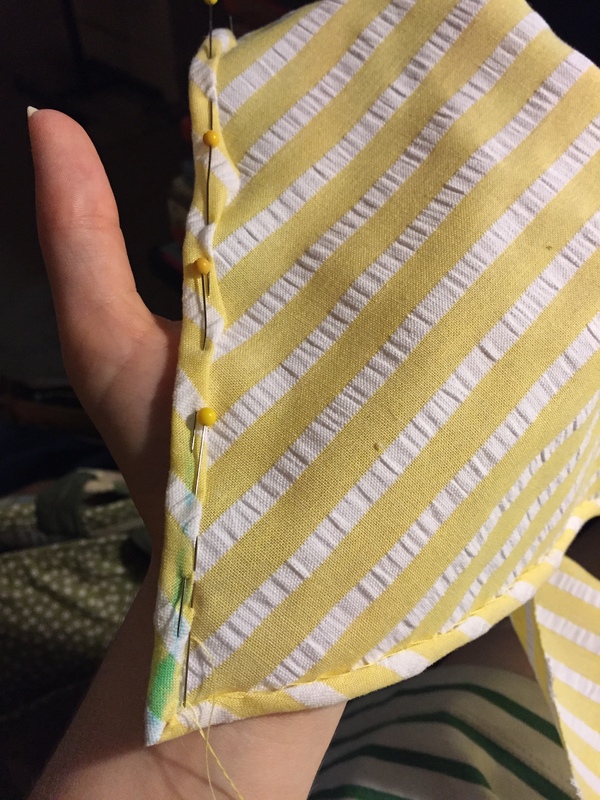 You can see that I’ve folded down the curve at the top of the skirt back. 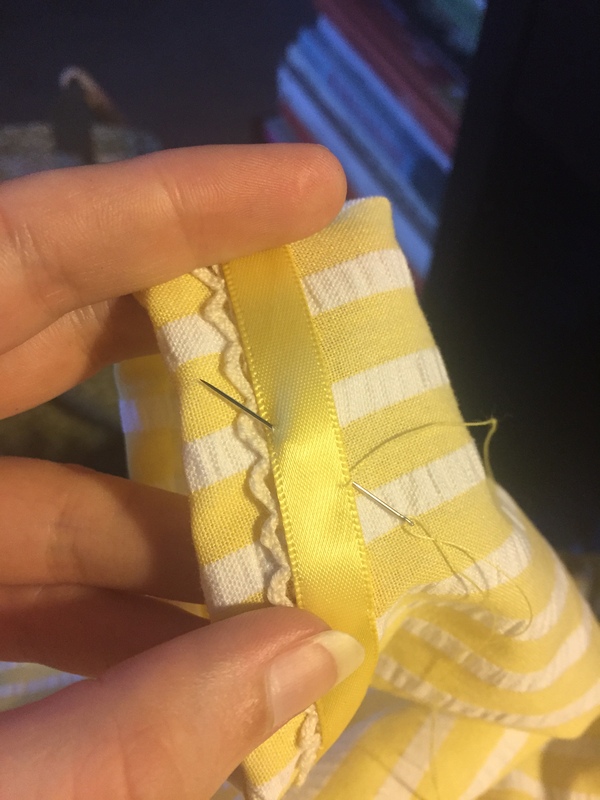 This makes the skirt work for a later-Regency walking dress, where the hem should be even all around, rather than dropped slightly in the back. 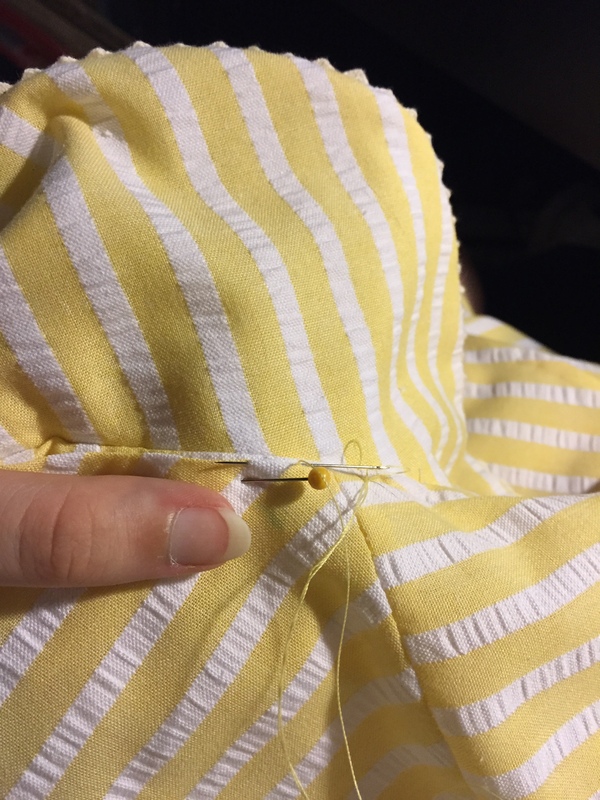 It’s possible to hem the original pattern into the right shape, but much easier if you keep everything straight right from the start so that the grain of the fabric is working with you. 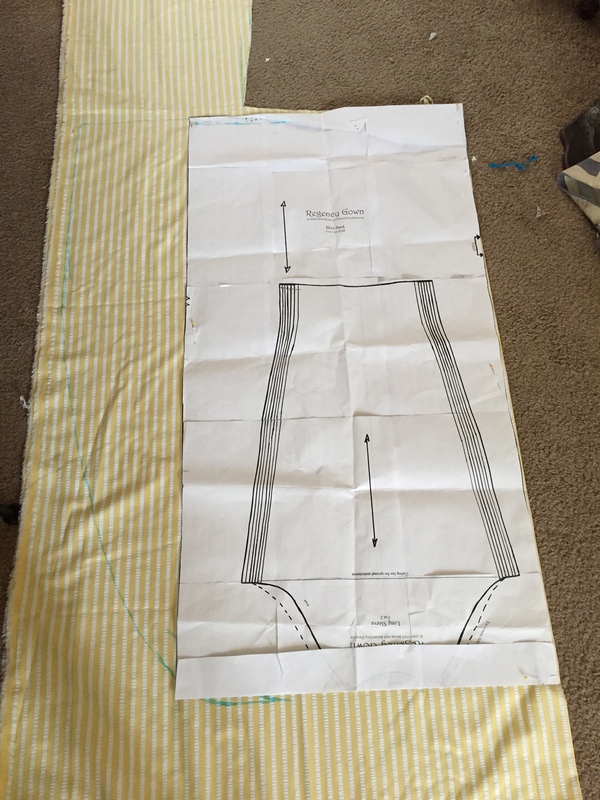 The blue line is where I’ve extended the skirt by half of my front underbust measurement and gradually curved it down to the hem. 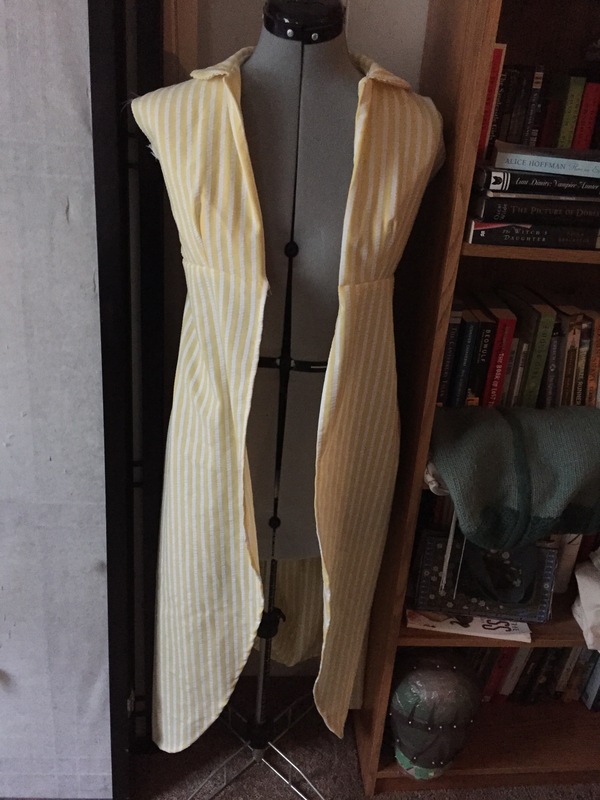 After putting together the bodice and lining, my first fun step was the collar. 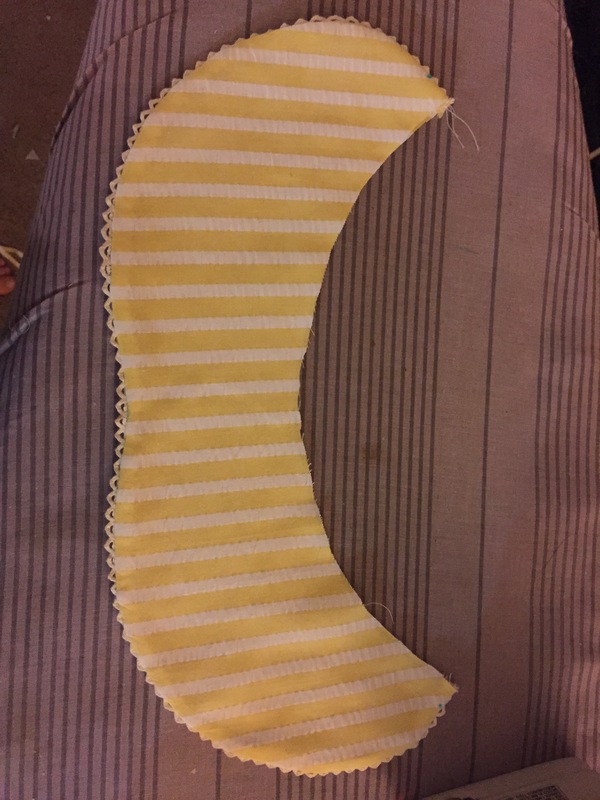 I tacked a small piece of trim just inside the seamline before sewing so that it would show when I turned the collar right side out. 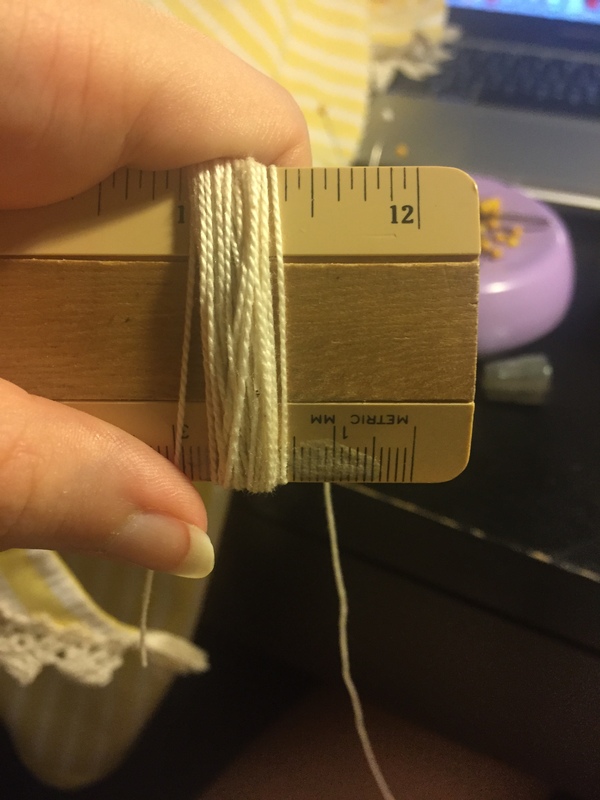 If you’ve never done this, it’s one of those things that gives you this extremely satisfying feeling of precise-work-well-done. I highly recommend it. Also, I love how the collar has that little dip in it to make it just that much more interesting. 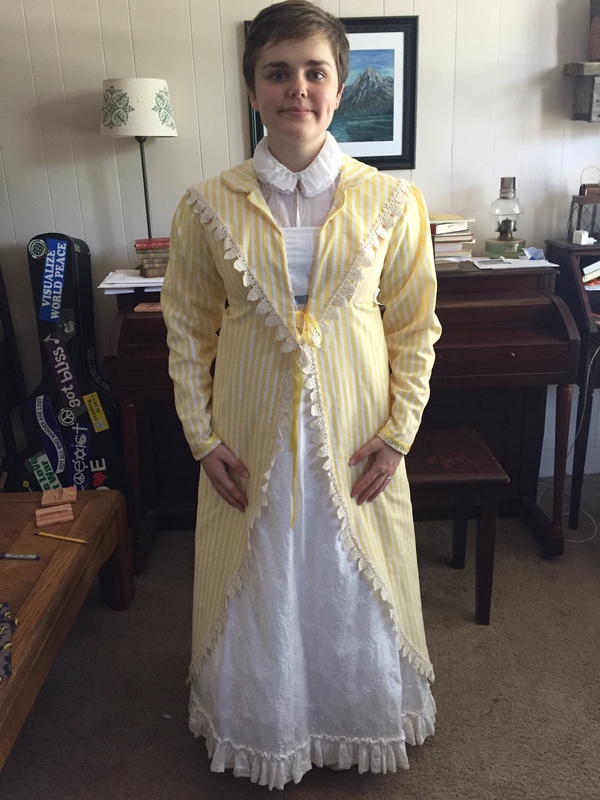 I gathered both the skirt back and the bodice back into the center, so that the underbust would fit nice and snug. 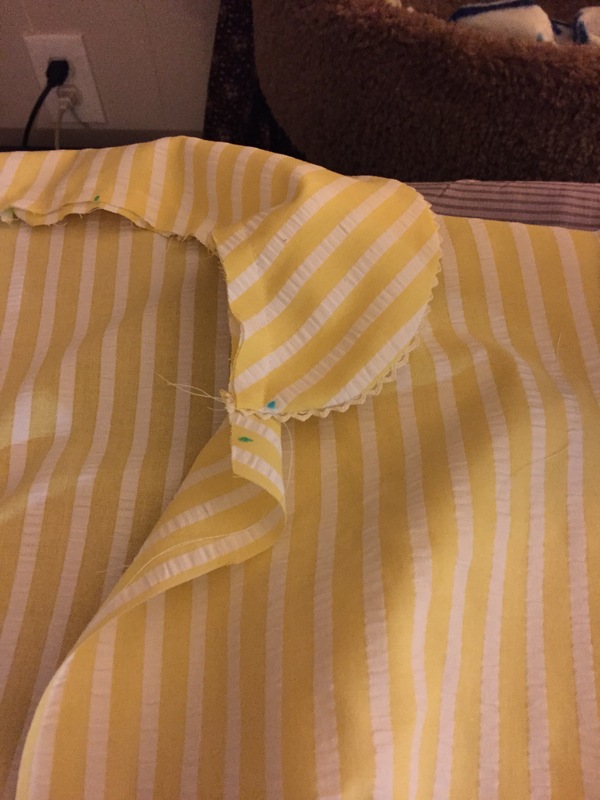 Before sewing them together, though, I had to hem and hem and hem and hem all the way around the edges of the skirt. And then I had to hem and hem some more, because it was time for the cape! 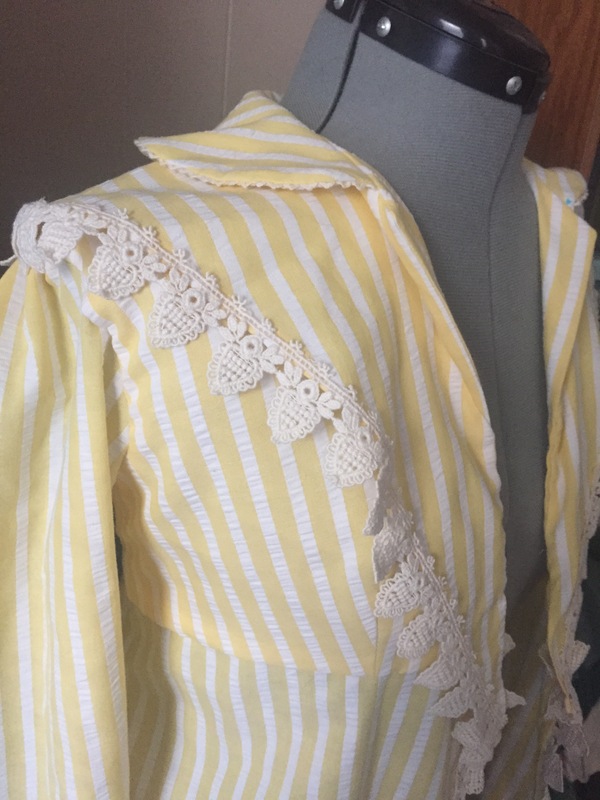 As I said above, the cape was then stitched on under the collar and along the front of the bodice, where it is mostly covered by lapel until it meets the edge of the bodice opening. The ends are free-hanging. 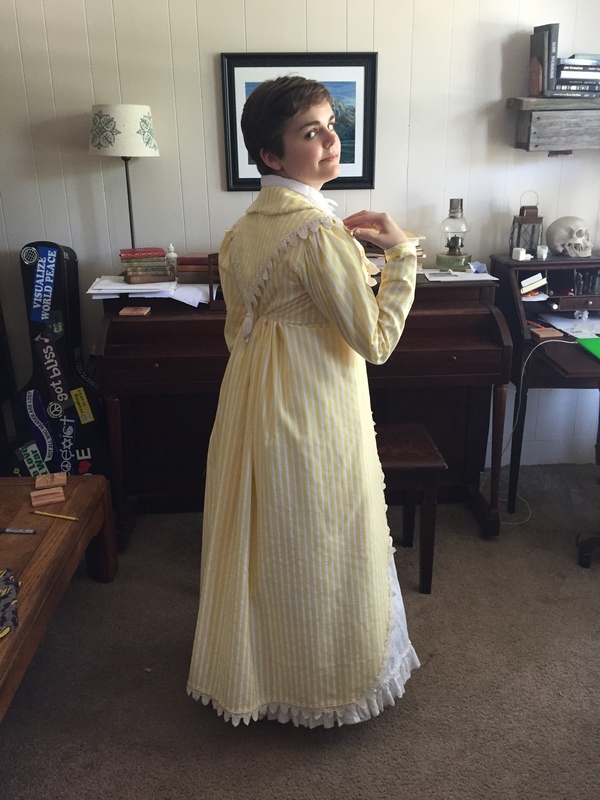 Now here’s the real reason I was so excited to make this particular pelisse. 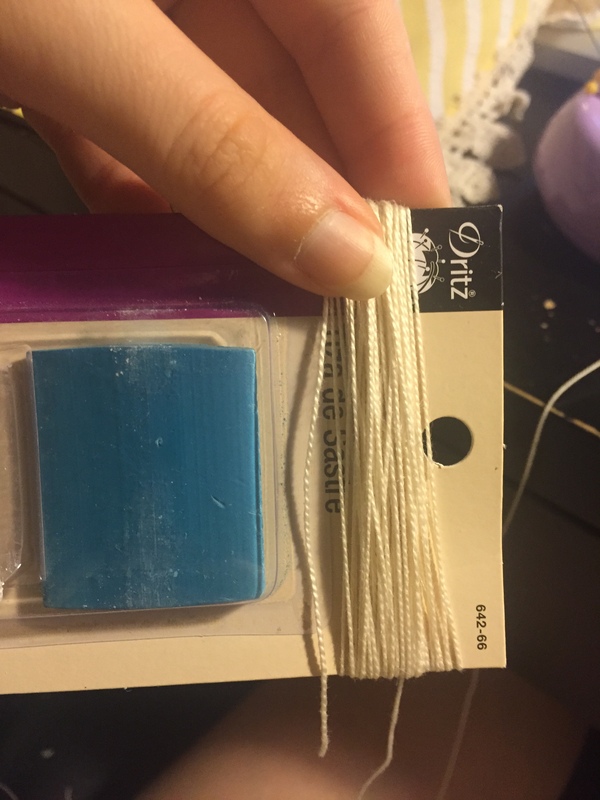 I’ve had the perfect trim hanging out in my stash for nearly two years, just waiting for the right project! I mean look at this stuff! Could it have been any more perfect if I’d gone out looking for it? 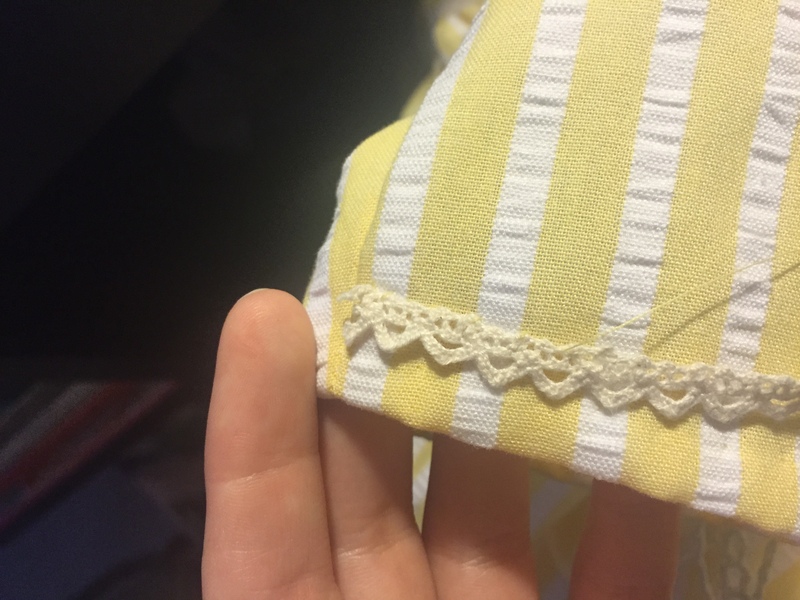 I love that this is the kind of trim you put on top of the hem, because it even has those adorable little picots on the top–wouldn’t want to hide them! Don’t worry, I gave it all a good press with a little starch when I was finished so they all lie nicely. 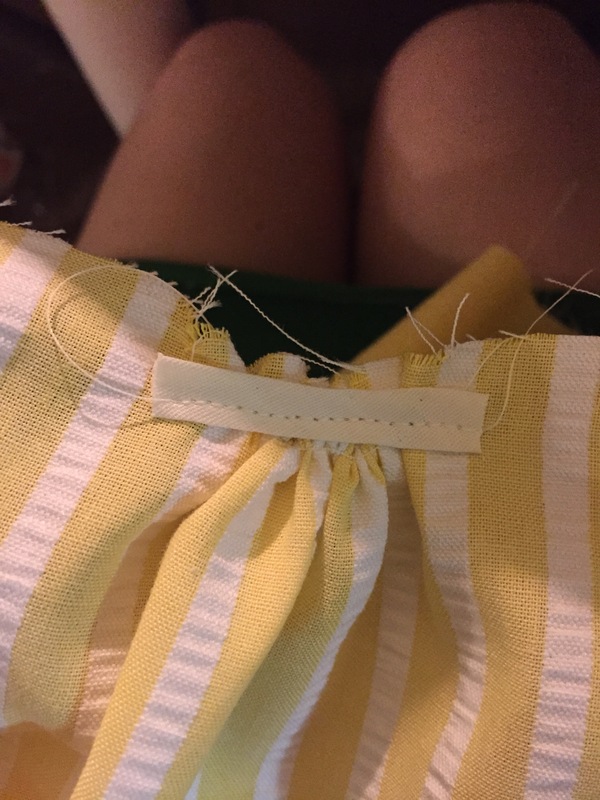 The sleeves were feeling unloved, so I gave them their own little bit of trim and ribbon to get them to stop grumbling. 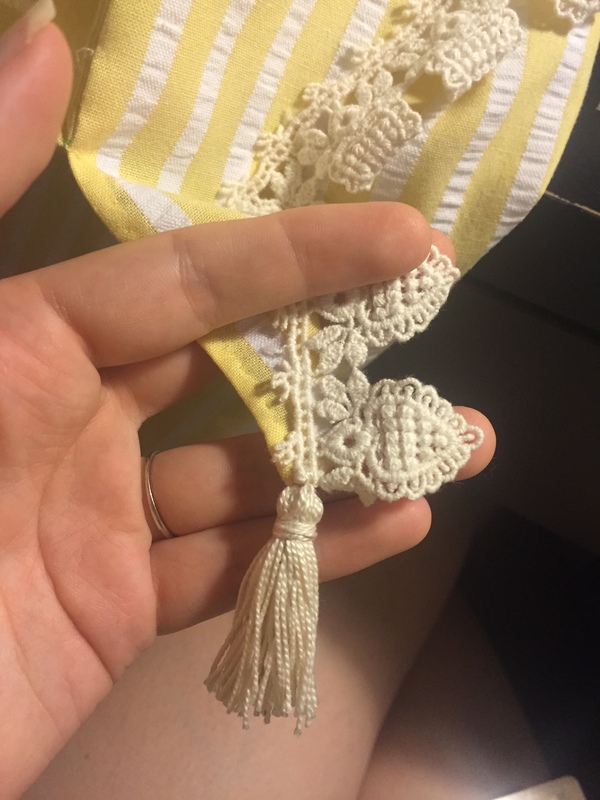 And now…tassels! 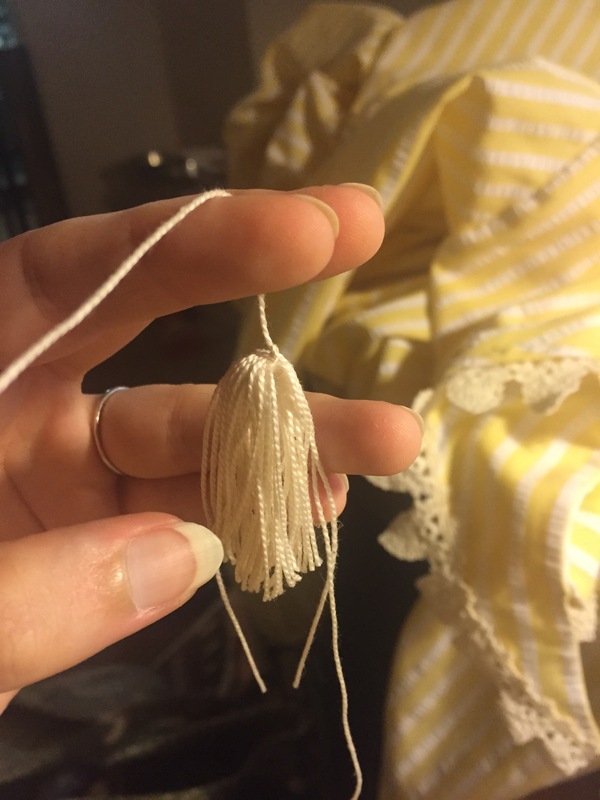 I made two little tassels for the ends of the cape in front, and a larger one for the back using whatever I had lying around on my desk to measure. I think I’ll probably move the front ties up a smidge and fiddle with the lapels, as I’m not quite happy with how they’re lying yet, but I love that cape in the back so much! 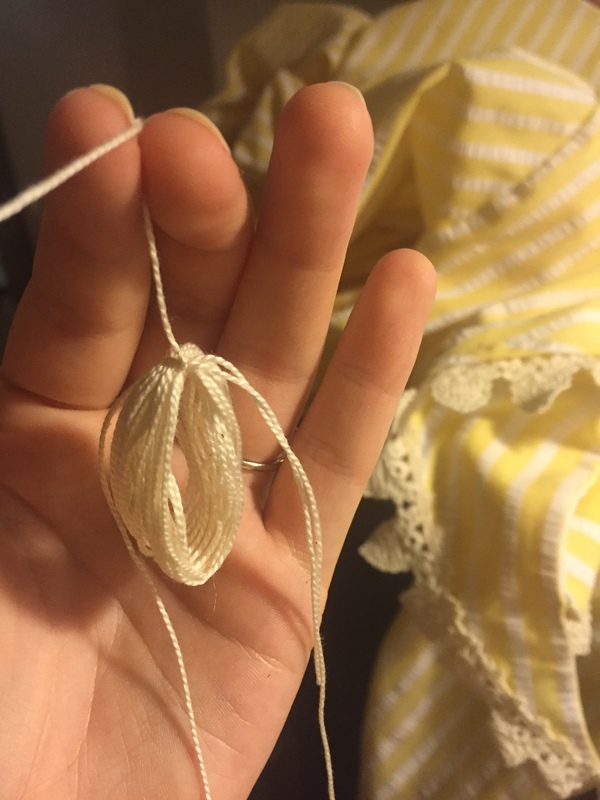 I just started working on a white silk bonnet to go with it. I’m embarking into unknown territory with this one, but I can’t wait to show you how (if) it turns out!